Let the princess debate end here, with the release of the latest VeggieTales entry, The Penniless Princess -- God's Little Girl. Typically, as regards stories and movies about princesses, people come down in one of two camps: either princesses are bad, because not every girl can be one-in-a-million and not every girl will respond well to believing she's in some way more special than others; or princesses are good, because with the way our culture demeans women, every girl should know she is seen as a Child of the King. As with so many other things Mom was right about, it turns out the prescription for healthy princess storytelling is to consume our veggies. On the heels of last year's Princess and the Pop Star (and before that, Sweetpea Beauty), Big Idea studios has an even bigger hit in the targeted-to-girls category. If my own kids (7 and 9) are any indication, even those who last loved VeggieTales when they were in preschool will enjoy this "classic" (as Larry the Cucumber is fond of saying in the introduction) tale about living consistently, whether prosperous or poor (see Philippians 4:12). Based upon Frances Hodgson Burnett's 1905 children's novel A Little Princess, this colorful version follows the story of Sara Crewe, daughter of "brave soldier" and diamond speculator Captain Crewe, left at Miss Minchin's boarding school for girls in London. Miss Minchin is a cruel headmistress, jealous of Sara's wealth and cleverness, and frustrated by not being able to find any weakness in the young girl's ever-so-kind personality -- a by-product of how her father has taught her to see herself and others as special to God. Even when Sara has the swankiest room in the joint, she befriends the school outcast Ermie, and the servant girl Becky, overwhelming them with kindness and access to all her books and playthings. When tragedy strikes and Sara loses everything, she goes from student to servant and penthouse to chilly attic, much to the delight of Miss Minchin, who nonetheless remains frustrated at her inability to "break" Sara via this change in her circumstances. Sara and Becky suffer, often go without food, and wonder why God hasn't yet rescued them from the situation they are in. But in their little room they pray, read the Bible, and encourage each other to love those who are unloving to them "no matter what." And so, they serve, and serve beautifully. It's that servant's heart which is at the center of this story. Yes, the tagline on the cover says it's about knowing our "true worth," and yes, it's about loving others because God first loved us (even citing Romans 8:39 directly). But what makes this such an impressive princess story is that every Christian person - not only young ladies - can relate to the concept of being the humble servant on the outside, royalty on the inside, no matter the circumstances. Both qualities work together to move us to compassion and sacrifice. What we learn is that Sara was ever always a servant, even when rich. But that she also never stopped being a princess, even when destitute. Ultimately, however, Sara comes to the point where she has lost, given, and served so much she can trust in nothing shy of a miracle. She receives it, but only because of others who themselves have been moved to compassion at her sufferings. The Penniless Princess is a powerful story for the whole family which draws parallels (even within the telling) to the story of Joseph, the son of Jacob, who went from favored status to having nothing, never losing sight of who he was in God's eyes. You may recall Big Idea already told that story in The Ballad of Little Joe. Now that they're concentrating on how to teach those same great lessons to little women, the VeggieTales crew has seized upon a message with as much worth as one of Captain Crewe's diamonds. But will boys like it? I can only point to my 9-year-old son, who wanted nothing to do with the DVD when I brought it home, but has since watched it twice (because it was on and he had nothing else going on) and said, "Wow, that is a really great story. Probably my favorite VeggieTales episode." Oh, and we haven't even covered the most important part -- the silly song! The one in The Penniless Princess will draw laughter and appreciation from anyone who's ever seen young people express their feelings through the abbreviated language of text messages. IMHO, Sara Crewe will become your new BFF as The Penniless Princess makes you LOL and CRBT (look it up). 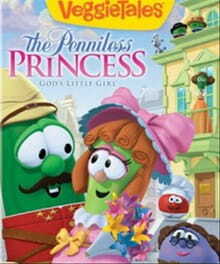 NEW VeggieTales: The Penniless Princess from bigidea on GodTube. Shawn McEvoy is the Managing Editor for Crosswalk.com. Lauren McEvoy is a rising second grader at Nuckols Farm Elementary School, an aspiring actress and teacher, and recently-baptized 7-year-old who has already watched The Penniless Princess four times.